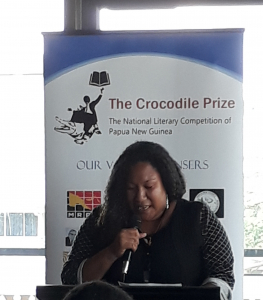 The Crocodile Prize is PNG's national literary prize, awarded to local writers in several categories each year. It was established in 2010 to encourage creative and critical thinking, and to encourage development of home-grown literature. The Prize offers great encouragement to emerging writers and six anthologies of prize winning stories have been published so far. Prize winners at the Ceremony: Iso Gabriel, Peter Jokisie, Evah Banige, Louisha Enos, and Jordan Dean. Library For All was a proud sponsor of the Children's Writing component of the 2017 Prize, and several of our PNG Advisory Board members have close involvement with the program. Peter Jokisie won the Library For All Writing For Children award this year with his story Charlotte and the Shiny Crocodile. The development of local literary voices is one of the exciting benefits of our Library's mission to create relevant, culturally-diverse books for kids. 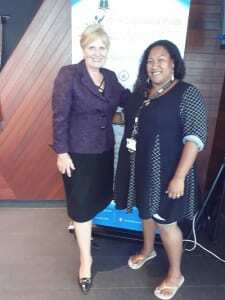 Additionally, Gretel Matawan, Library For All's PNG Content Co-ordinator has worked with the Prize team as a volunteer. She was invited to present a speech at the recent Crocodile Prize Award Ceremony about the benefits of volunteering with a program of this nature. Her inspirational words are shared below. Click here to see the full list of this year's winners. I had first heard about the Crocodile Prize when I was in High School at Marianville Secondary and later on, I finally had the chance to grab a hold of the first book that was published, “the 2011 Crocodile Prize Anthology”. But what really piqued my interest about Crocodile Prize was when Emmanuel Peni (chairman of Crocodile Prize) approached me and asked if I could help him with the Registration of the Name ‘Crocodile Prize Inc.’ at IPA. Being Manu (as always), he then sat me down and proceeded to give me the history of how Crocodile Prize had started and how it came out to be. It was life changing, an exhilarating 20 minutes of my life. I literally got hooked from that moment. I definitely was impressed with Emmanuel’s passion for books and, if I must say so myself, I myself am a bookworm at heart. My passion for literature, for books and the countless hours spent reading, made me intrigued and fascinated in the amazing world of imaginations and stories that books provided for me. A few of my favourite books as a child (which I am sure many of you may fancy as well) - were the Harry Potter series and Agatha Christie’s murder mysteries, which were always filled with uncanny twists and turns, the mysteries, drama tangled in with authors imaginations, beyond the readers’ wildest dreams. Even though it has been a while since I have read those favourite books of mine, they are still and will always be my prized possessions. As a person, I was not out spoken or loud and I often withdrew into myself when put into the spotlight. It was Emmanuel who saw the potential in me as a person that could contribute greatly to Crocodile Prize as a Volunteer. He saw the opportunity to expand my knowledge in literature and empowered me every step of the way, even till now. Personally, I was finally doing what I loved most and that was reading. From that moment, I started assisting, helping Emmanuel to organise the 2016 Crocodile Prize Award Ceremony that was held last year at the Australian High Commission, volunteering because of same the passion which had drawn Emmanuel to Crocodile Prize. That was the year when we had our first youngest winner of the competition, Mary-Catherine Tavore. I had perceived that moment as being only the beginning; the beginning of my journey with Crocodile Prize. - I got to know some amazing people I had never thought I would have the opportunity to even meet who had same passion for books as we did. Crocodile Prize was always an opened door, the fuel for my passion for books and of course, a stepping-stone for me to bring talented local authors and illustrators out there together in achieving what Crocodile Prize was meant to achieve in the first place. That was to be the channel, one of the key platforms in improving literacy levels in our country. But it wasn’t always easy being a volunteer for Crocodile Prize. As a volunteer for Crocodile Prize, I had to find the balance with my work as a Research Assistant at the Institute of National Affairs (INA) and a voluntary Communications Liaison with Crocodile Prize. - and then schedule meetings with potential sponsors. Yes, I will admit, it was exhausting but it was all worth it. But it was also exhilarating for Manu and I; we could both see that same excitement reflected on our faces.The sweat and shortness of breathe from running here and there attending to different tasks, it was all worth it. As an account of one of my many journeys with the Crocodile Prize, I was generously sponsored by one of our major sponsors (MRDC) to accompany their Public Relations Officer Iona Sharon Reto, on a visit to do awareness in the project area schools in Kutubu last year (2017). We visited Kikori Secondary School, Gobe Agricultural School and Don Mosely Primary School located in Sembrigi. I can say that there were a lot of firsts for me on that trip, definitely a great experience and a journey of a lifetime. I even got to go in a helicopter, and I will admit, I was scared at first. Trust me when I say that some of you may not want to see the view from up there, especially those that have acrophobia as I do. I did not even want to look out the window and I kept on checking the seat belt for no apparent reason. But one of the perks was that I got to eat in a mining camp’s mess hall and the food was to die for. The peak of my journey was when I had my first by-line in the Post Courier, the centre-fold. Definitely a big achievement for me was to have my four-day journal put out there for the country to see. Not only a great experience for me but a big achievement in putting Crocodile Prize Out there on the map for the whole country to see. I believe without a doubt through Emmanuel, the Crocodile Prize brought out my passion and created that foundation of knowing what I wanted to do most in life. And that is to contribute towards expanding and increasing literature in PNG. It also provided that space for me to expand and grow as an individual and a team player. My opinions and decisions were valued and I felt appreciated. This motivated me to be the best that I knew I could be. Crocodile Prize definitely gave me that push to come out of myself, my shell and show my passion for books and literature as a whole. I can safely say, with helicopters and jaw dropping views, I loved every minute of it. Crocodile Prize was the nudge that I needed in my life. It opened many doors and showed me that there are many opportunities out there for me, I just had to see it through different eyes. 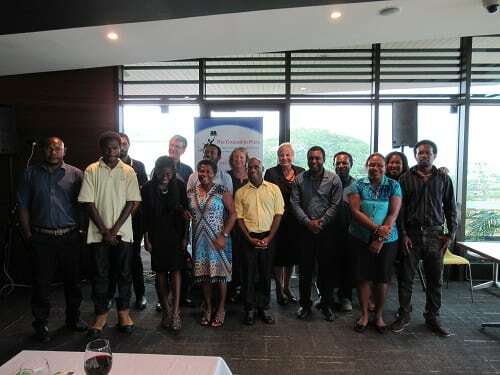 Towards the end of last year, Crocodile Prize was invited by CIMC to present to a team made up of representatives from World Vision, Library for All and University of Canberra. That was when another door had opened for me, which I had not perceived, but eventually, I had to say good bye to Crocodile Prize and follow a new but similar path in my life. Emmanuel had given me that opportunity to be a part of that potential partnership and I had been most happy to participate in any way that I could. This had then led me to having the job that I have now. In my current new line of work, my job is centred on bringing stories to life and creating books that are mainly targeted for the younger generation – the Elementary Level. I get to connect to a wider and larger community, I get to read books every day and have stories illustrated, I interact with people around the world, sharing knowledge and seeing other sides of literature from nearly every corner of the globe. I can safely say that being a Volunteer with Crocodile Prize has had a great impact on my life, provided me that foundation, cementing my path in life. When I first began, I was not sure of myself and I wasn’t confident. Through being a volunteer, this led me to that pathway. With the utmost gratitude, I will forever be grateful to Manu and Crocodile Prize Inc. for giving me that opportunity to expand and to grow out of my shell. I am more confident than I ever was, and sure of myself, I owe that to my time as a Volunteer for Crocodile Prize. So what can you do to get further with the same passion that led me to The Crocodile Prize National Annual Literary Competition? I will say, It is important that we, the authors, the illustrators of tomorrow, those passionate book lovers all need to work together to ensure the continuity of the Crocodile Prize, it is a beacon in achieving something more than our selves. One person cannot do this on their own; It takes a committee to do this and an active one at that. I understand that, Yes, we may have our own commitments and day jobs, but an hour of two, can go a long way in helping a good cause. 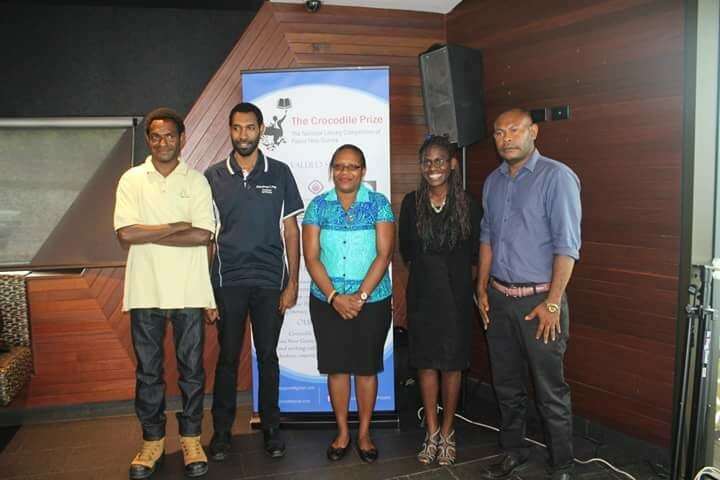 We need to all work together to help in achieving our cause and that is, ‘Improving our literacy levels in PNG, I believe Crocodile Prize provides that opportunity for all Papua New Guineans and for all ages’. Finally, I would like to say thank you to our Chairman Emmanuel Peni for being the glue and the stronghold for Crocodile Prize, You have done an amazing Job so far.